As more and more reviewers rely on loaner devices and being first with a review to stay afloat, long-term reviews of laptops are becoming rarer. However, the overall user experience, manufacturer support, and engineering are aspects that are difficult to speak of without an extended period of time with a machine. The lack of an initial reviews’ ability to judge such issues has led, in my opinion, to many machines receiving sub-par after-sales support. I hope to break this trend by logging my long-term experiences with certain machines as an end-user, and today we will do just that with the Lenovo ThinkPad P1 / X1 Extreme. 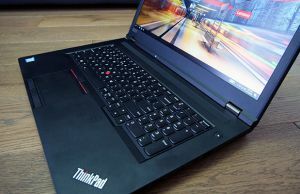 I’ve made little secret of the fact that the ThinkPad P1 is my favourite laptop to date, mentioning it quite a few times in articles and podcasts. Andrei reviewed the 4K X1 Extreme variant (meaning it had a GTX 1050Ti Max-Q rather than P2000), awarding it a 4.25/5. While his unit was a loaner, however, I purchased my P1 with my own funds and have been using it daily for the past 3-4 months, meaning I’ve been much more exposed to its shortcomings. 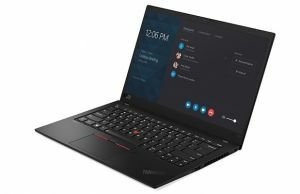 Just how well has the ThinkPad X1 Extreme/P1 held up over daily long-term usage? Read on to find out. Andrei and I talk about our picks for best laptops of 2018. 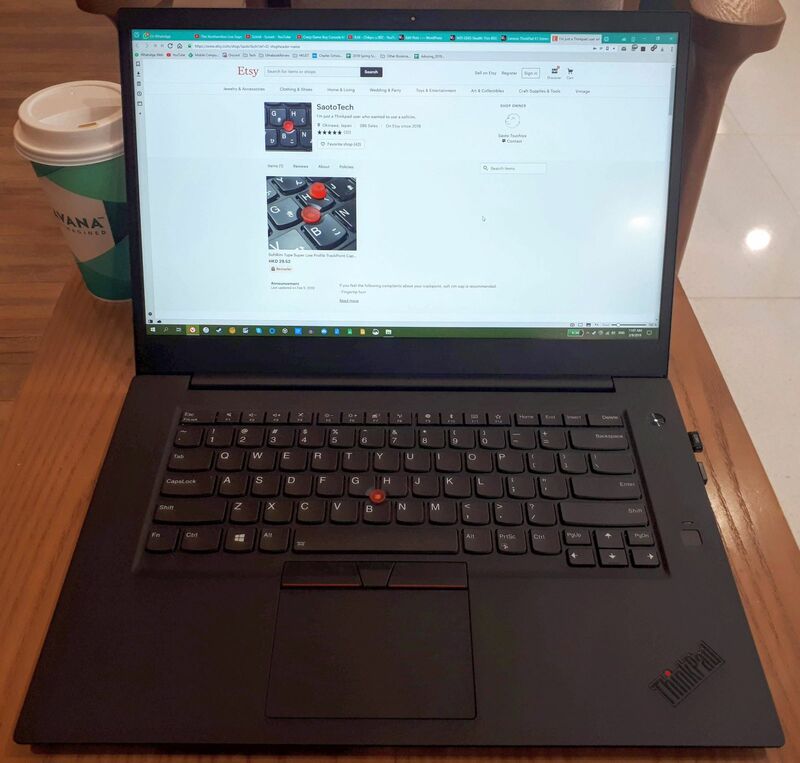 The P1 / X1 Extreme scored points with us for its smart design, but sometimes small design problems don’t become evident until you’re forced to use the laptop for a few hundred hours. In the case of my P1, I have very little to complain about. The 180-degree hinge characteristic of ThinkPads, camera shutter, dedicated trackpad buttons, TrackPoint, weight, and overall ergonomics of the machine are things I appreciate on a daily basis, even after months of use. The fact that the FHD model of the P1 is only around 3.75 lbs is absolutely fantastic compared to the competition, which are all around half a pound heavier or more. There are only a couple of mild complaints I have on the overall design, which are the propensity of the finish to pick up oil and grease smudges, and the fact that I don’t feel comfortable just throwing the P1 in my backpack’s laptop section without a case. The soft-touch finish is very comfortable to have on the deck when typing, but I do get a little paranoid about accidentally slashing it with a nail or damaging it somehow. Unlike my X1 Carbon, luckily, I haven’t found a single point of wear in the finish despite over a hundred days of throwing it into my bag (in a case) and working several hours a day on it. Very nice, Lenovo. Smash like and subscribe. Custom soft-rim TrackPoint provided by SaotoTech. ThinkPads are known for their input, and the P1 provides an overall excellent experience with a couple of small asterisks. The action and travel of the keys, in general, is sublime, and I really like the smoother texture of the keys on here compared to the anti-bacterial keyboard on my T470. It really does feel like giving your fingers a massage. 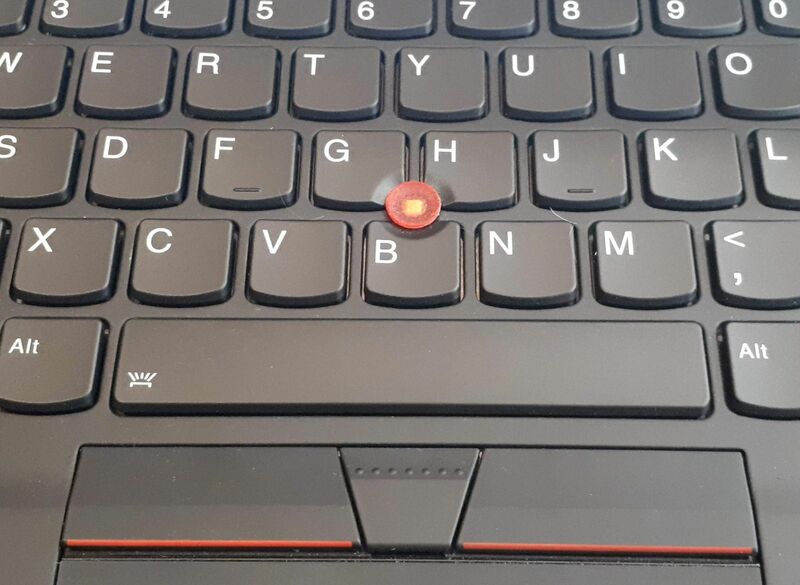 The TrackPoint, for which I got a custom-made soft-rim replacement (easier on the fingertip), is always a benefit on ThinkPads, as it allows one to type and mouse without ever removing the hands from the home row of keys. The trackpad is quite nice to use, as well, and it’s on par with the best Windows machines have to offer, such as the XPS 15. If I did use the trackpad, I would prefer to have a second set of dedicated clickers at the bottom of it, but that’s a matter of taste. There are a couple of occasional bothers I have with the input, however. The first is the well-documented ThinkPad keyboard firmware bug, which still seems to affect both X, T, and P-series machines. In short, typing two adjacent letters very quickly will result in the key presses being read erroneously. For example, typing “download” very quickly will reliably produce “download”. 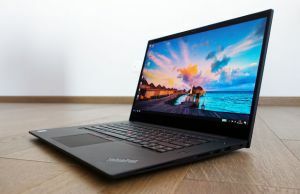 Lenovo has been informed about the bug and they fixed it on their E-series laptops, but there is still no word on whether they are working for a fix for the rest of their ThinkPads. The second mild annoyance I have is with the dedicated buttons above the trackpad. Occasionally, my left-clicks are not registered when I press the right-most side of the button, despite getting firm feedback. More annoying is the middle scroll-button, which modifies the TrackPoint to control directional scrolling when depressed. Unfortunately, you have to keep this pressed quite hard, as otherwise, the scrolling action will often cease registering after a couple of sections. It’s a small thing, but it throws you off every time it happens. Probably the biggest gripe I have with the P1 overall is its fingerprint scanner, which is a Synaptics SGX. It works around 40% of the time for me, and even when it does work, it takes a good 2 seconds to place my finger in just the right spot and wait for it to scan. I have tried registering different parts of my scanning finger and updating the software, but it is still an unreliable and frustrating biometrics device that achieves little of the improvement it was designed to provide. This is one area where I expect significant improvement from Lenovo on in the future. Equipped with 16GB of DDR4 2666 RAM, an i7-8850H hexa-core CPU, and Nvidia P2000 GPU with 4GB of GDDR4, the P1 should feel snappy in quick operations and burly when tasked with heavy multi-threaded operations or blended loads, such as gaming. Luckily, it does all this with aplomb. The P2000 is roughly 5-10% slower than the X1 Extreme’s GTX 1050Ti in gaming, but it still provides more than enough performance for 60FPS+ 1080p gaming at medium-to-high details for most modern titles. I do a lot of processing of audio files, which taxes all 12 cores of the i7-8850H, and it just chews through the workloads when plugged in. With such a thin and light chassis, the P1 does produce noticeable noise and heat when taxed, but also at sometimes less predictable times. I play a lot of Killing Floor 2 (great game, by the way; it has evolved immeasurably since I bought it in early-access a few years ago) and the fans noise is only occasionally audible over the sound from the game, though it does rev up at times. With a -120mv undervolt, temperatures on my CPU tend to max out around 85C. This is fairly good for a Coffee Lake device with such a slim profile, in my opinion. Less thrilling are the warm chassis temperatures and fan spin that occur whenever Windows feels like hijacking the CPU, which usually happens when restarting or at occasional random times. This is Microsoft and Intel’s problem more than Lenovo’s, but with such a thin chassis, it is quite noticeable when a Coffee Lake laptop has its CPU utilized. Still, the carbon-fiber case does a good job at not getting as blistering hot as aluminum, and external temperatures never get to the point of uncomfortable. The P1 and X1 Extreme pack a moderately-large 80 Wh battery, which is large for an ultrabook but smaller than other similar laptops such as the XPS 15 and Gigabyte Aero, which pack in 97 Wh+ batteries. The P1 is smaller and lighter than either of those laptops, however, and one-ups the XPS by having 2 m.2 NVMe slots rather than 1. Battery life on my FHD model is usually 7-8 hours with my regular (light) workload of browsing with Vivaldi, Google Docs, and music. This is after some tweaking with ThrottleStop including undervolting and disabling turbo on battery, however, so expect around 6 hours if you are not into tinkering. There is an annoying bug with Windows and machines with a dedicated GPU that is directly connected to video output, such as the case with the P1. Basically, when using an external monitor either through HDMI or USB-C, the dedicated GPU will always be used to power new apps/processes. When you unplug the monitor, the processes continue running on the dedicated GPU. The GPU will not terminate the processes until you force it to, the easiest way of which seems to be to go to the Device Manager then disable and enable the GPU. If I do not do this, the GPU stays active on battery power and will chew through the 80 Wh in less than 3 hours, all while generating more heat and noise. This is my personal bug-bear on this machine, and I hope Microsoft, Lenovo, or Nvidia can find a way around this bug. They cannot possibly expect an average consumer to figure out that the dGPU remains active and draining power because an external monitor has been used at some point. Lenovo deserves to catch a bit of flak for their BIOS support of the X1 Extreme and P1. Essentially, these models shipped from the factory with an option in the BIOS that could permanently brick the machines when utilized. The really ridiculous part is that it’s taken Lenovo more than 3 attempts and 4 months to finally produce a BIOS update that fixed the bricking issues, which you can read about the recent development of here. Luckily, I read forums quite frequently and was not caught off-guard by the buggy BIOS, but it’s still not acceptable to have such unreliable and poor quality BIOS/firmware support on professional and workstation-class machines of the caliber of the P1. At least they didn’t pull a Dell and permanently throttle the GPU without telling anyone, though. What about the report that thermal throttling occurs at 80C when virtualization is enabled in bios? I haven't tried virtualization as it isn't part of my workflow, but I would assume that report is correct. A good repaste will be your best bet for that indeed. I haven't had anything repeatable with the WiFi. I've had a couple disconnects over 4 months but that's it. I'm currently on my second P1, given an RMA for the first. Issues that I've run into, which persist in the second I've received are below. This laptop is fully loaded btw, Xeon + P2000 + UHD. 1. Trackpad is jumpy. Occasionally a click will jump a few hundred pixels. Sometimes massive acceleration that scrolls an entire article down. Frustrating, but perhaps driver related and may eventually be fixed. 2. Bottom plate of laptop case, not snug and vibrates with sound. No way to tighten down further and requires different screws or washers to fix of they want then truly snug and solid. Sorry, but this does not feel MIL-SPEC. 3. USB devices randomly disconnect. Without any touching, in both windows and in booting (i.e. not just a driver issue). Touching the device may cause a disconnect as well. Seems like the physical ports are not solid. Trivial stuff like the oils in the finish are quite noticable, but not a huge deal compared to what you would be getting out of this gorgeous and performant device, would that the build quality was better. I want to love this laptop, but given the above I can't. Hopefully, Lenovo takes note and focuses some effort to improve this. Back to searching for a UHD laptop alternative. I haven't experienced any of those except the bottom plate issue with the screws not properly going in. What seemed to have happened was the tip of the screws broke off in the mid-chassis, and then they wouldn't properly be received again. I had to call support and have a new bottom + mid chassis swapped in, but that was worth it to take care of the loose bottom. The other issues do seem hardware related. Odd that both happened with both of your P1s. Everything updated, I assume? I wonder if it could be related to the Xeon mainboards? Yeah, I thought that it was very odd too. Seems like whichever batch of boards I got in mine were defective. I could plug in a USB drive and just sit there and withing minutes it would disconnect, both in Windows and Linux btw. Definitely hardware. Touching the USB drive in the slightest would result in disconnects. All very unfortunate, because these are gorgeous and performant laptops. Great thermals given what's packed inside, etc. The Xeon Fab process could have just been bonkers with my batch, true. I almost tried a third time, requesting a different lot of motherboards, but unlikely they would include it even know how to get that done given the red tape. Couldn't gamble a third time and honestly their support didn't seem to care or want details about the problems. I had full up premier support btw. They never called me back when they were open and just let my return with normal support stand, even though they were supposed to get in touch. Disappointing… If they promised a different result and quicker, I would have said sure. I ran into someone with the X1 Extreme during this time btw, which uses the same chassis, but they didn't have any of the same issues in the short time they had theirs. They were loving it. Pretty sure the trackpad issue was driver related or related to their multitouch sensor being flakey. I've had to RMA move for almost identical issues, but a lot more goes on with these track pads. I would have held out hope for a fix if that's all that was wrong. The screen was gorgeous. A little uneven lighting on the edges when on black, but could have lived with it. Now that Samsung has released UHD OLED panels at CES, I'm looking into a laptop using those… The vendors are just starting to ship new models that use them. Supposedly super dark blacks and whites that are twice as bright…perfect for outdoors. Just boxed then both up and said goodbye :( Honestly, it was hard to let them go. I worked on them until the last day, despite the issues. Sorry to hear about that. I've had similar issues here in Hong Kong with their support. Complete lack of interest ; I had to handle them with kids gloves to help them do their own job and ensure I even got the stated follow – up. Don't manufacturers know that we'll pay more for better quality and support by now? Had the same issue , one usb a port disconnect on thinkpad p1 i5-8400h quadro p1000 , just got it back , same 2 usb ports put back on new motherboard, no more issues , i thought it was the usb ports but its something else which is weird because touching usb key would do it . Oh my, so you mean that somehow Lenovo gave you free hardware upgrade? Your long term reviews are great, much appreciated – far more valuable than the 'reviewed and returned' model. Can you comment on the FHD screen quality – is the brightness ok at ~300nits? Yes — I was thinking of mentioning it but ended up not because it was so satisfactory. The screen I got (a replacement due to the original having uneven lighting) is really quite nice. It's definitely bright enough to use outdoors. Great writeup. I'd like to ask a few questions about the screen. 1. What'a the bit depth on FHD? You can check in Settings > System > Display > Advanced display settings. 2. According to PSREF contrast is 700:1 which indicates subpar black levels. How is it really? 3. Do you know if either the FHD or 4K support HDR Mobile? Apparently you need W10 1809 and higher to enable HDR. 3. I'm not sure how I can determine this, but if there's some specific media you want me to check with, feel free to link me! I'm zeroing in on the X1E / P1. I probably won't need ECC any time soon, but I am curious if there might be any discernible gains in DAW performance to be had by opting for the Xeon's larger cache, in spite of the added heat? Or would it be safer for "glitch free" real-time audio to go with the slightly cooler i7? I have not found any reviews/posts with results of undervolting the P1 Xeon. Also any credence to vague notions that the P1 will in some way be better suited for real-time audio than the X1E, are DPC latencies lower due to the presence of Quadro instead of GeForce, or are there any optimizations specific to the P line's drivers that would help prioritize audio performance? Are the ISV certifications really all they're chalked up to be in terms of being "taken seriously" by support? More power is always better to prevent those untimely hiccups, but unless you are doing some very serious real time post processing or something, I don't think you would have any issues with the non-Xeon. However, I would consider disabling speed step or using a speed step control software to lock it into performance mode while you are doing something that needs to be hiccup-free. Either way, I'm guessing that just having the discrete GPU will be helpful to prevent any system memory sharing that could have an impact. No idea about the audio chipset though. The P1 is considered a professional Ultrabook rather than an enthusiast one, so you may get more attention from support? Not sure, but I'd opt for the premium support despite my less than stellar experience with them. At least you will get taken care of quickly should you have an issue. What kind of audio stuff are we taking…like professional DAW software (reason, sonar etc)? How bad is the keyboard bug? How often would it affect you thought the day? Thanks ! I was almost decided on getting it but this is holding me back, I do tend to type very fast and it's surprising this bug exists on so many models. Is there any hope this will be fixed by Lenovo ? Would this hold you from buying it again? 1) How much time does it take to boot into the log-on screen? I don't know if I'm having a driver issue etc, but it takes about 30 seconds..
2) did you make a fresh installation of windows? 3) lastly, do you use lenovo vantage for driver updates? I'd say about 11-12 seconds, which includes my 3 seconds dual boot screen for my rescue partition. I was having problems with my swapped in ssd so I just did a clean windows reinstall on the original ssd. I don't use vantage for updates, I prefer to go to the website every few weeks and check for myself. I have intel 512gb ssd which came with this laptop. it is a nvmee ssd so there shouldn't be any noticeable performance difference.. Did you make the installation from lenovo factory image or from microsoft website? Do you also download the latest gpu drivers from lenovo website? I like this laptop, I just want to solv these little but some kind of annoying issues.. I don't recall any changes in BIOS. I used the factory image that came installed, didn't even wipe it. Using latest GPU drivers from lenovo and all other drivers. Secondly, can you suggest a case for the device? 2nd drive is a cheap 1TB WD Blue m.2 ssd, first is the 970 evo 512 GB. I'm able to undervolt my cpu to -140 mv by using XTU. however, it still gets to 96-97c during the cinebench test. İs it because of bad thermal-paste? did you make a repaste? I did not repaste, my results are on stock paste. I've had the X1 Extreme for four months now and I got to say, I'm a tad disappointed myself. There are a few things the reviews don't mention about this machine. My biggest issue is with the portability of the laptop. It's light and the keyboard is great, but otherwise I don't feel it's very comfortable to use. I feel the touch pad is too small and registers palms as misclicks too often. The bottom of the laptop also gets uncomfortably hot during use, as the air vents are located at the bottom. Top of the keyboard also heats up pretty quickly in just normal use. The display, despite looking great in the optimal lighting, is not bright enough to be used in sunlight. As the display is glossy, it also reflects a lot of light. Then there's the battery life and performance on battery power. It's only about three hours when equipped with the 4K model. Itself this wouldn't be a huge problem, but the Anker 26800 mAh battery pack with USB-C PD I have just refuses to charge the laptop. With MacBook Pro I used previously it works just fine. So you need to carry around the big power brick wherever you go. On a wall USB-C charger you'll get enough power to keep the laptop running, but not to charge the battery. On battery power you'll lose around 20 % – 30 % performance compared to what you'll see plugged in. And note that plugged in to USB-C charger you'll have the same performance as with just being on battery power. Anyway, even plugged in, don't expect to just buy this computer, at least with the i7-8850H, and have it perform optimally. The thermals are bad out of the box and you'll experience thermal throttling. You'll need to do undervolting to about -140 mV and likely open the case and repaste the CPU to get better thermals. Even still you'll see the CPU temps hit 100 C on pretty normal use. The lowest it'll go will be around 45 C when you do absolutely nothing. While you have the case open for undervolting, I would also recommend removing the film covering the air vents or otherwise you'll want to wear headphones when the fans start spinning – the fan noise out-of-box isn't music to the ears. I paid 4300 € for my configuration and I feel like things should mostly just work at this price point. Then there's the aforementioned Hyper-V related throttling issue. If you're a developer, consider very carefully if you ever need to enable Hyper-V before you buy this computer. If you do, for example because of Docker for Windows, just keep in mind there's unsolved issue that causes the laptop to thermal throttle at 80 C instead of at the normal 100 C. When you regularly hit 100 C on normal use, it'll hurt the performance when you'll start to throttle 20 C before that. On normal use it's not that noticeable, but compiling larger projects and on synthetic benchmarks you'll see ~20 % performance drop with Hyper-V enabled. Some other problems I've had are numerous BSODs, laptop randomly shutting down with the lid closed and both of my two Acer H277HK monitors not working through the USB-C/Thunderbolt 3 connection. Also randomly some audio controller device stops functioning and I lose the audio through my monitor speakers. Now, a word on quality. In the time I've had the laptop, I've had three motherboard replacements (BIOS setting change bricked one, one of the USB-As was non-functioning, attempt at fixing no display through USB-C), one replaced display (dead pixels) and the entire body casing has been replaced once because after all these replacements, the backplate screws wouldn't tighten anymore. Though I have to say I've been impressed by how well the Lenovo service works. They really come to your home and replace any part on premises. Of course, you might have to wait for the parts. I had to wait two weeks for the new display and one month for one of the motherboards when the BIOS bricking epidemic was at it's height before Christmas. But out of four visits, two happened very quickly after filing an warranty repair order. So… If you're looking for best performance and especially if you don't care about portability that much, go with P52. You'll get better thermals and performance for almost the same amount of money. Also, with better thermals, I feel like this laptop would be more comfortable to use, so you might gain something on that department too.